Going back a bit, I hacked the Firefly RPG for use as a BattleTech RPG. The result was Baronessa Rahela Dalca, a young MechWarrior from the Magistracy of Canopus. This time around, I want to create a character from one of the major Houses in the setting, House Steiner. 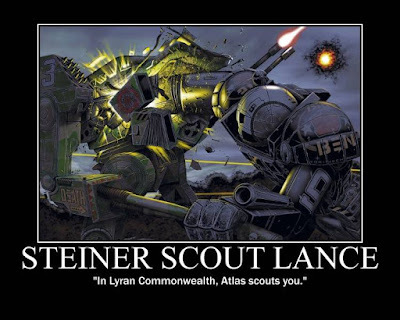 The core concept is that the character is he is a career MechWarrior in the Lyran Armed Forces, an officer, but without the noble connections Rahela has. Since the distinction will be needed, I'll add it here for easy reference. The MechWarrior distinction was created with the guidelines found in the Firefly core rules and represents the basic training a Mech pilot should have. As a reminder, Drive covers driving anything on the ground, from skateboards and motorcycles to hovertanks and BattleMechs. Operate refers to using most electronic systems, from handheld tablets to starship navigation systems. Shoot covers firing anything, from longbows to long-range missile (LRM) racks. This time around, I'll go step by step, though I may just gloss over the full approach. First Leutnant Victor Milner is a veteran of the Federated Commonwealth Civil War, the war that broke that nation back into the Federated Suns and the Lyran Alliance. He serves still as the second in command of Third Company, 5th Donegal Guards, and commands a recon lance. 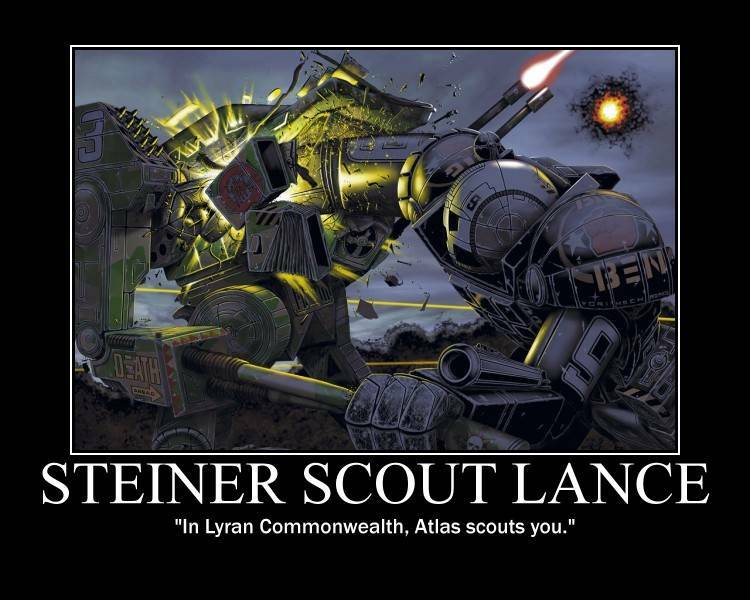 However, the Lyran military doesn't believe in using light 'Mechs. Victor pilots an Axman, a jump-capable heavy 'Mech with an autocannon, one LRM rack, medium lasers, a large pulse laser, and a hatchet. While the LRMs have limited ammunition, the lasers give the Axman the ability to head out on a long range patrol without having to worry about resupply. I'll keep Victor's attributes d8s across the board. He's not outstanding in any one attribute. First distinction is MechWarrior, as shown above. The listed skills get stepped up one die type. Next distinction is Alliance Officer. In Firefly, that refers to the Alliance in the TV series. Here, I'll rename the distinction Lyran Alliance Officer; the result's the same, even if the name's different. Reskinning is far easier than creating from scratch. This distinction lets Victor step up Fight, Notice, and Shoot. Fight will cover using the Axman's hatchet; remember, the skills are broad. The last distinction taken is Veteran of the FedCom Civil War, a renaming of Veteran of the Unification War. Victor gets to step up Fight, Shoot, and Survive. Victor gets two triggers, along with the standard "Gain 1 PP if you roll a d5 instead of a d8" every distinction has. He takes Sir, Yes, Sir and Fightin' Type; the first reflecting his position in his company, the second because of his experience in battle. The first bit, stepping up the skills associated with the distinctions, was done back in Step 2. That just leaves spending nine points, with each step up costing one point if the skill is a highlighted skill for a distinction, or two if not. Victor steps up Drive, Notice, and Survive for three points total, then steps up Influence, Know, and Move to use up the remaining six. Before spending the five points available for specialties and Signature Assets, I need to deal with Victor's free Know specialty, received for having it higher thanm a d4. Since he is a recon pilot, I'll give him Unit Heraldry; Victor has studied the different unit insignia, letting him better identify who his lance has found. The first of the five points available gets spent on Axman at d6. The 'Mech is his, assigned to him when he graduated from the Academy. He spends the second point for a Survive specialty, Forests. A third goes to the Operate specialty, Sensors. A fourth goes towards his third specialty, Command, under Influence. The last point gets him a second Signature Asset, his School Rag, bearing the colour of the Academy he went to. Victor keeps the Rag with him in his Axman as a reminder of why he joined the service and why he fought on the side of House Steiner in the Civil War. Technically, some of this was done in Step 0. There's still details like home world, military record, what people call him, and the like. For now, higher ranks call him "Leutnant", lower ranks call him, "Sir", and his friends call him Vic. Time taken, about an hour, mostly to look up details about House Steiner. However, one more detail is to come. First, though, Victor's character sheet. Chain of Command: Gain 1PP when you step up a Complication because of orders you received from your superiors. * Sir, Yes, Sir: Spend 1PP to create an Asset at a d8 to represent a specialist under your command. * Fightin' Type: Spend 1PP to step up or double your Shoot or Fight when you're outnumbered. War Stories: When you create an Asset or take a Complication related to a wartime flashback, step it up. That last detail? The Axman. I've been treating BattleMechs like ships in Firefly. Vic needs his 'Mech, just as Rahela needed her /Hussar/. First up, working out the class distinction. What makes an Axman an Axman? For the attributes, I gave Engines the d6 to reflect the slower nature of the heavy 'Mech. Hull gets the d10 because the Axman is heavy, but not Highlander heavy. Systems gets the d8 to reflect the electronics, especially since Victor is using it as a recon 'Mech. I now need two distinction triggers. First, the Tomahawk Chop represents the use of the 'Mech's hatchet. Hop Skip Jump represents the 'Mech's jump jets, letting it get past most obstacles but taking a pounding on the lower structure. Sixty-five ton 'Mechs aren't supposed to be bouncy. With the class distinction out of the way, Victor's Axman needs two more distinction. Armed and Dangerous is ideal here, given the weapons the 'Mech has installed. The other distinction taken is Battle Scarred; Victor and his Axman saw a number of fights during the Civil War. The next step is to choose two distinction triggers. Y'All Are Outgunned feels right for the Axman; heavy 'Mechs are weapons platforms, carrying far more than lighter 'Mechs, giving the pilot the ability to take out an enemy with one salvo. The other trigger taken is Tomahawk Chop; Victor has no problem in closing with an enemy 'Mech. The last step is to take two Signature Assets for the 'Mech. The obvious first choice is Hatchet. It's why the Axman has its name. The second choice is Command Communications Suite; Victor is the second-in-command of his company and needs to be able keep in touch with the lance commanders. * Tomahawk Chop: Spend 1PP to use Hull instead of Systems when making a physical attack. Hop Skip Jump: Step down Hull to step up Engines for the rest of the scene. Banned Modifications: Take a You Can't have Those d8 Complication when the authorities discover that your 'Mech has been altered to gain 1PP. * Y'All Are Outgunned: Spend 1PP to double Systems when fighting a 'Mech that lacks your firepower. Come On Baby, Hold Together: When you push your 'Mech to the limits, ignore a complication for a roll. After the roll, step up that Complication. That Part Don't Work Anyway: Step back your Hull for the rest of the scene to step back a Complication that's just been inflicted on your 'Mech. Next week, Cortex+ in action with Rahela and Victor!